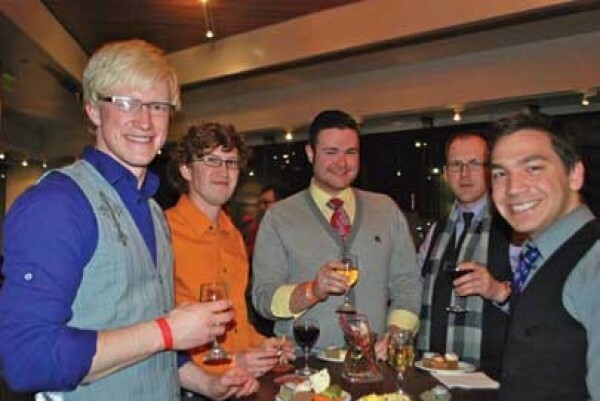 For a guys’ night out, Cody Christensen wears a cardigan and tie rather than a Utah Jazz jersey; instead of nachos and beer, he and his friends eat tiny cupcakes and drink Pinot Noir as they hobnob with world-class classical musicians. “What happens when you go to the bar to watch a sports game? You don’t talk to people, and you don’t get much out of it,” says the full-time chemistry student. Christensen prefers a night of symphony with Vivace, the “funkified” group of young(ish)—20- to 50-somethings—concert-goers who get their groove on to classical music. The Utah Symphony Utah Opera program was designed to help demystify the traditional symphony experience and make it more accessible. A Vivace evening begins at Abravanel Hall, where the members sit together, read from a unique, witty version of the program notes, watch a hand-picked concert and then attend an afterparty with Utah Symphony and Utah Opera performers. There’s booze (lots of it), hors d’oeurvres and lively conversation—not your stereotypical stuffy, staid night on the town. “It’s like a little bit of New York in Salt Lake,” Christensen says, adding that this is his first season attending the series, which celebrated its seventh anniversary March 2012. Vivace is part of a trend called young-professional groups that are in other sizeable symphony markets like San Francisco, Boston and Chicago. Vivace—which means lively or vivacious—is the third incarnation at the Utah Symphony; the current run began April 30, 2005. “If we’re not reaching out to the next generation of patrons—if an organization isn’t doing that, they are screwing themselves in 20 years,” says Vivace audience-development consultant Crystal Young-Otterstrom, adding that Vivace is reaching out to a specific kind of consumer: one with an interest in culture, but not a regular patron of the traditional arts—they need something edgier. There are attractors aside from music and alcohol, though. “I think the biggest draw is meeting like-minded people. I often hear, ‘I thought I was the only person my age who liked classical music,’ ” Young-Otterstrom says, adding that it’s a great place for singles to mingle—although Christensen isn’t of like mind. “I don’t go trolling for dates at the symphony, by any means—I don’t think you can. I run into people like my junior high science professor,” Christensen says with a laugh. For Wen Flatt, associate principal second violin, it’s also about making a connection. With rock & roll, musicians face the audience and there’s a give/take relationship. “Sometimes we don’t get a reaction immediately [in concert]. It always makes me happy to know that they are still awake,” she says with a laugh. “I love the Vivace events, because I get to speak to the people and hear their thoughts about the music,” Flatt says. It’s a casual high-brow affair, to be sure. This list absolutely has to include the ever popular, ever famous, ever wild Symphonie Fantastique, subtitled “Episode in the Life of an Artist” by Hector Berlioz. In Berlioz’s words, the symphony tells the story of “an artist gifted with a lively imagination” who has “poisoned himself with opium” in the “depths of despair” because of “hopeless love.” I don’t know about you, but I bet the opium contributed to that “lively imagination.” Indeed, Leonard Bernstein, the famous composer of West Side Story, called this piece the first musical expedition into psychedelia because of its hallucinatory nature. Wait—you’re shocked? Sorry to burst your bubble, but composers have been tripping for centuries. Charles Ives: A Symphony: New England Holidays (1913). Ives (1874-1954) nearly flunked out of Yale and even belonged to Wolf’s Head, the third-oldest secret society at Yale. Maybe if he’d belonged to Skull & Bones he could have been a president instead of a composer. He became a self-made millionaire selling insurance, and composed on the side. His music played with polytonality, microtones and many other weird musical terms with long names. Wikipedia them—things that are still considered new and experimental a hundred years later! Hopefully, you’ve heard of Mozart. If not, you probably skipped all school. There may also be something seriously wrong with you. If Mozart were alive today, he would be bigger than Elvis and get around more than Casanova. All you really need to know about his life is that he was the most amazing child prodigy who ever lived, and he was a coprophiliac. OK, that’s not necessary to understanding his music, but it makes Mozart 100 percent more awesome. Don Giovanni is about the Original Playa up to no good with rampant sexcapades, which makes everyone out to get him. At an hour long, yes, this piece is freakishly long—but it’s also freakingly amazing! This will knock your bloomers off. Seriously. It’s that astounding. Shostakovich, a Russian composer in the mid-20th century, is always mind blowing, but this symphony is especially so. Why? Well, the subject matter for starters: It’s all about the events surrounding the 1905 Revolution. Now, before you start freaking out about whether or not this piece is all about pinko communists, let me remind you that the communist revolution was in 1917.